Pardon me for publishing the same picture in two posts, but this vase has hidden meanings. Actually, lots of Chinese paintings have hidden meanings. Many meanings come from features of the Mandarin language. 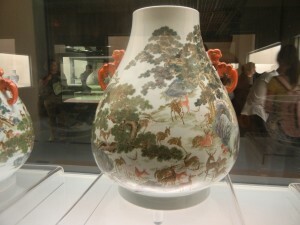 So, we’ll take a closer look at this vase, and see some ways that Chinese language and thought have shaped each other. A recent post already described how the smooth rhythms of light and dense areas on this vase represent yin and yang patterns. 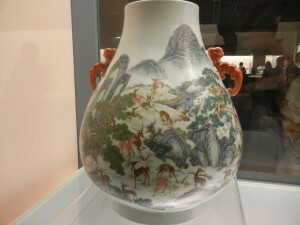 The vase thus portrays a landscape in which everything is in harmony. But in addition, the portrayal of all those deer has a special meaning. The word for deer, lu, is also a word for the salary of an official. It’s thus not income from the bare-knuckle world of merchants. It’s a stable income that comes from an established rank in the political system. This revenue stream was pretty much set for life in imperial times. Thus, parents back then wished that their sons would attain high ranking positions in the government. So, parents or other elders gave art with deer motifs to a young man starting out in the world. The above vase stands next to the first one. The cypress-family trees around the deer are called bai in Mandarin. Bai also means 100. Translation: May you receive 100 salaries. The number of words in Mandarin is very limited. It’s monosyllabic. It has only 4 tones. And its phonetically simple–it doesn’t have lots of mixtures of vowels, like Thai. So, a single word means many things. This gives Chinese art many hidden meanings. 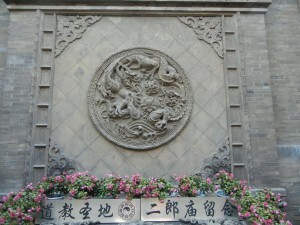 A bat nestles in each corner of the above motif from a Daoist temple in Ping Yao. Bats in Chinese traditions are not the diabolical creatures that they are in the West. The Mandarin word for bat, fu, also means blessings. The most popular bat motif has 5 of them–they stand for the 5 blessings: a long life, wealth, health, love of virtue, and a peaceful death. So, 5 bats comprise a popular motif in Chinese folk art. The Mandarin word for clouds, yun, also means good fortune. So, a painting of bats flying in the clouds means, May you have blessings and good luck. Shoutao means both peaches and longevity. So, peaches are very popular in Chinese art. Sometimes they’re paired with a bat: May you have blessings and a long life. 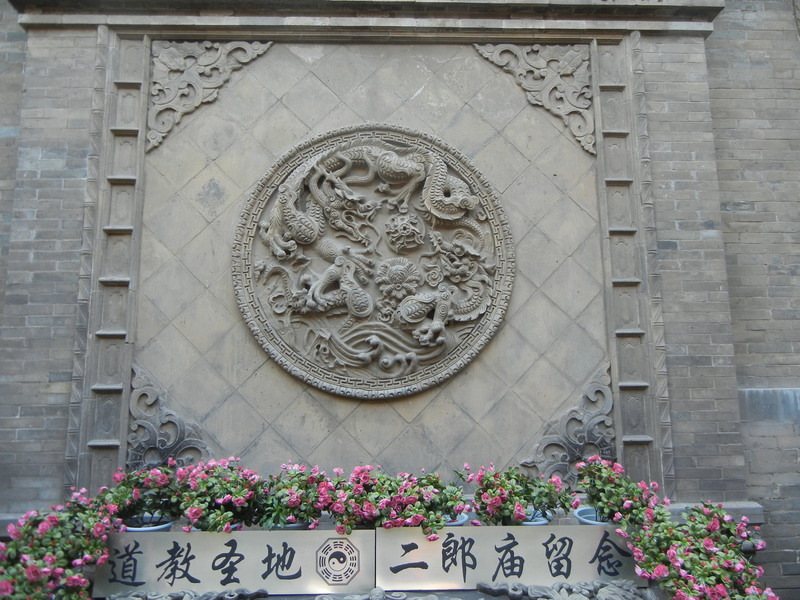 So, there are endless combinations of images that have symbolic meanings in traditional Chinese culture. Mandarin doesn’t just detail distinct objects and make precise statements–Western philosophers have assumed that these are the central features of language. Mandarin evokes a world of poetic resonances, in which things are intimately related. Things are not just distinct–they resonate with each other. Terese Tse Bartholomew’s book, Hidden Meanings in Chinese Art, is an excellent introduction to word-play in Chinese painting. May you have many bats and peaches!